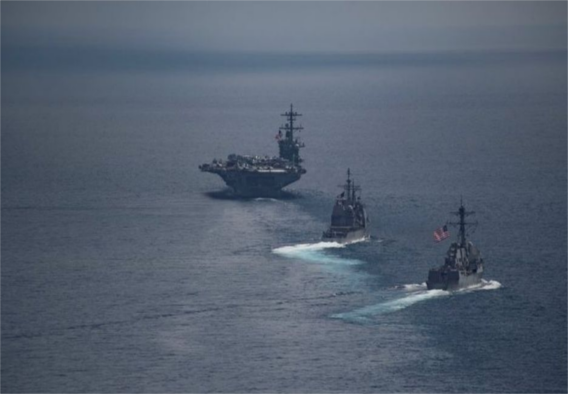 The US Navy said on 8 April that the Carl Vinson strike group was travelling to the Korean peninsula amid tensions over Pyongyang's nuclear ambitions. Last week President Trump said an "armada" was being sent. The US military's Pacific Command said on Tuesday that it had cancelled a port visit to Perth, but had completed previously scheduled training with Australia off its northwest coast after departing Singapore on 8 April. The strike group was now "proceeding to the Western Pacific as ordered". Either way, US Vice-President Mike Pence was undeterred as he spoke aboard the USS Ronald Reagan - an aircraft carrier docked in Japan - during his tour of the region, vowing to "defeat any attack and meet any use of conventional or nuclear weapons with an overwhelming and effective American response". On Wednesday, Mr Pence described the country as the "most dangerous and urgent threat to peace and security" in the Asia-Pacific.